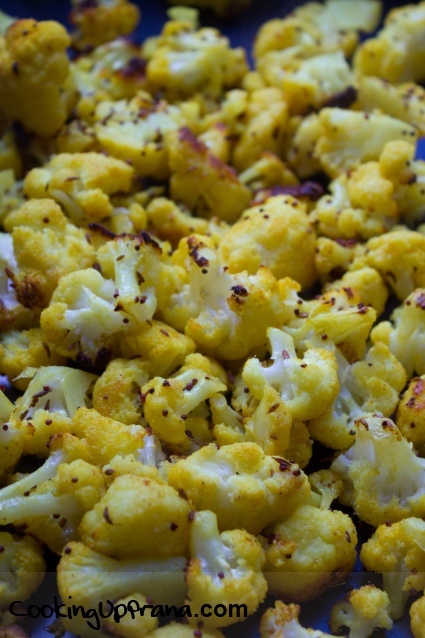 For me, roasted cauliflower is a feel good, comfort food. 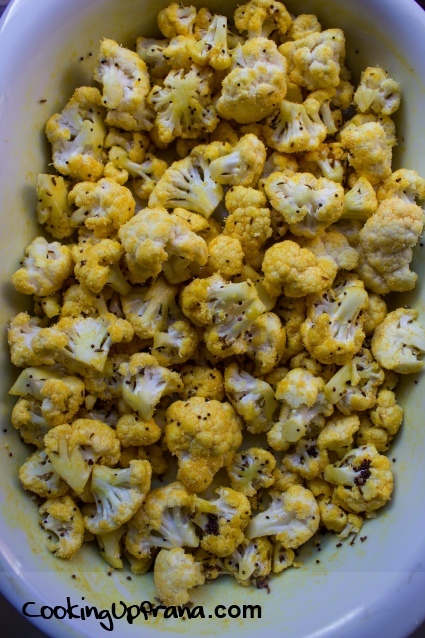 In this dish, the light taste of the cauliflower is perfectly complemented by bold Indian spices (cumin, turmeric, cayenne pepper, and mustard seeds). Depending on how much cayenne you use, it’s not made to be super hot and spicy, but definitely has the zing that you’d imagine from an Indian dish. But this dish is more than just the taste. 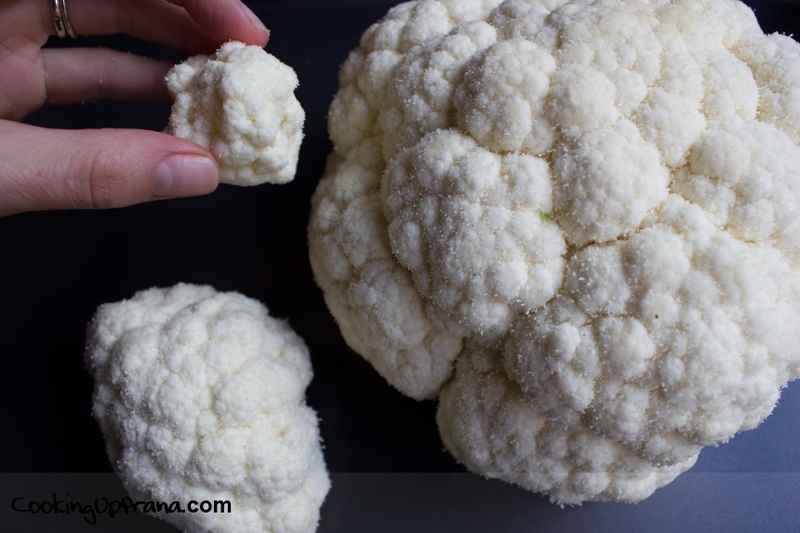 Three florets of cauliflower is enough to provide you with 67% of your daily requirement of vitamin C.
Regular consumption of cauliflower may also reduce the chance of certain cancers. 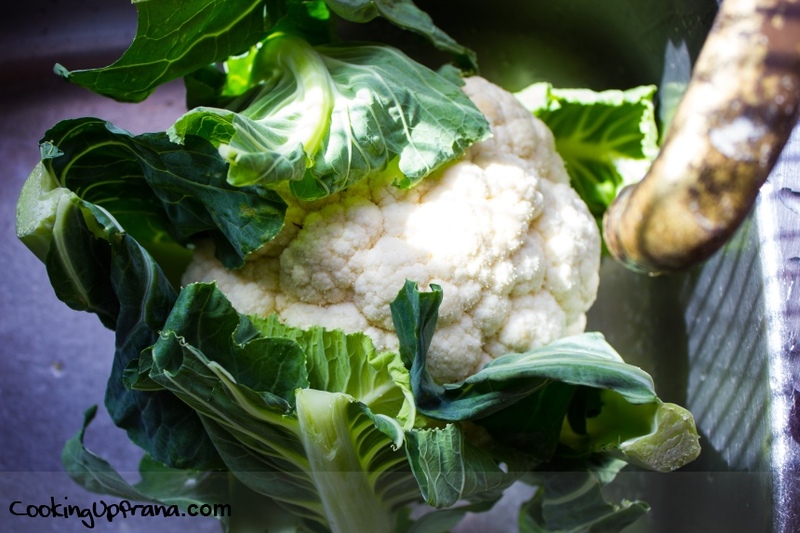 According to an animal study done at John Hopkins University, sulforaphane, one of the main ingredients in cauliflower, lowered the occurrence of breast tumors by about 40%. A Canadian study found that including cauliflower or broccoli as part of a regular diet reduced men’s risk of prostate cancer by 52%. And, the best part about this dish is it’s really quite easy to make. 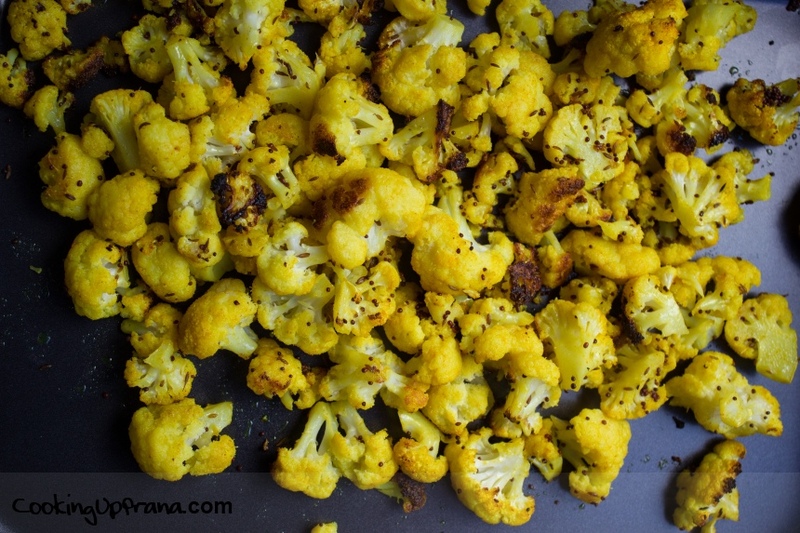 A quick whisk of the spices and oil and then drizzle over the cauliflower florets. Mix it up well so they’re evenly coated and then pop in the oven to roast. Above is a before and after roasting. You know when your cauliflower starts to brown on the bottom and is easily pierced by a pairing knife. Preheat oven to 375 degrees. 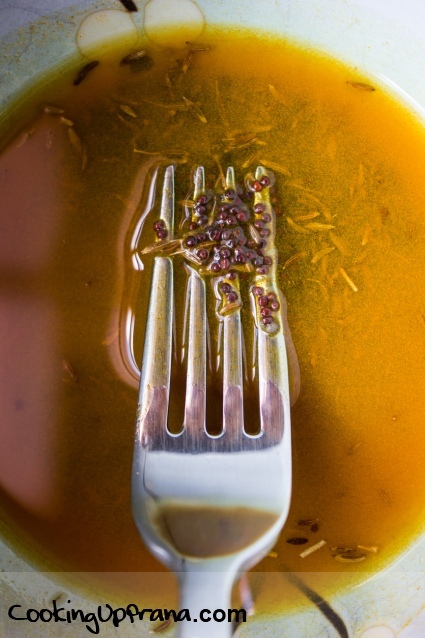 In a small bowl, whisk together oil, mustard seeds, cumin seeds, turmeric powder, cayenne pepper and salt. 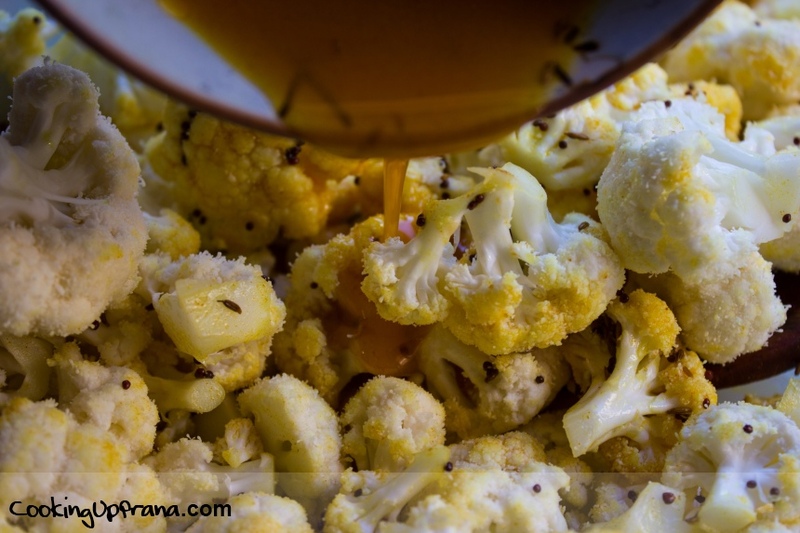 Place the cauliflower into a rimmed baking dish and pour the whisked oil with spices over it. 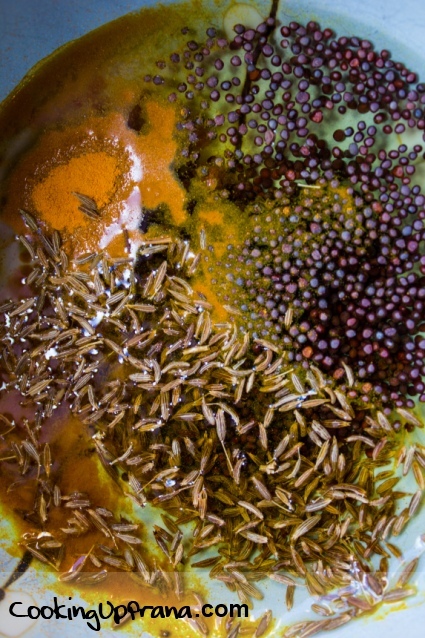 Mix to coat evenly with spice mixture. 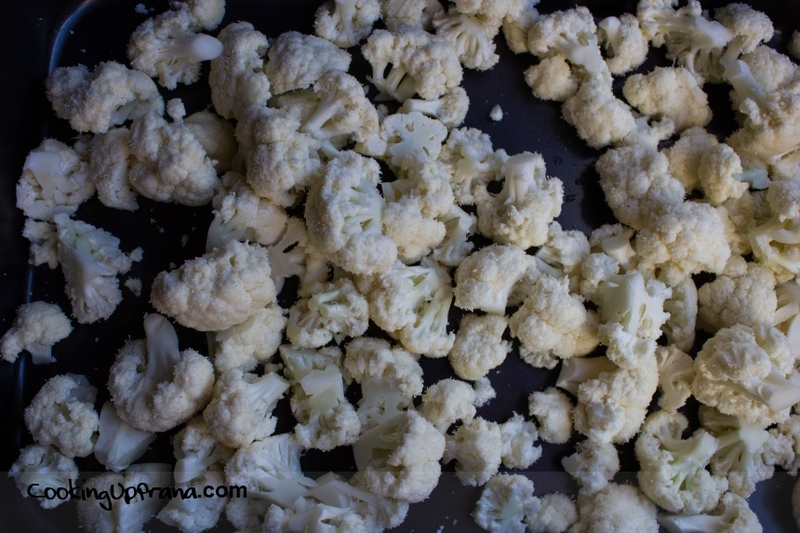 Arrange cauliflower in a single layer. Then, roast roughly 35 minutes until florets are browned on bottom and tender when pierced with the tip of a knife. Serve immediately. I will try this recipe with Turkish spicies instead, sure it will be nice though! Thank you for this!